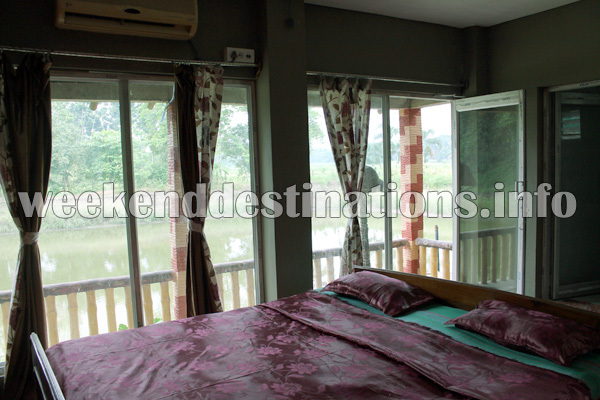 Staying in three ethnic cottages located beside two large ponds surrounded by more than 180 species of plants and an overdose of greenery can be your next weekend destination near Kolkata. 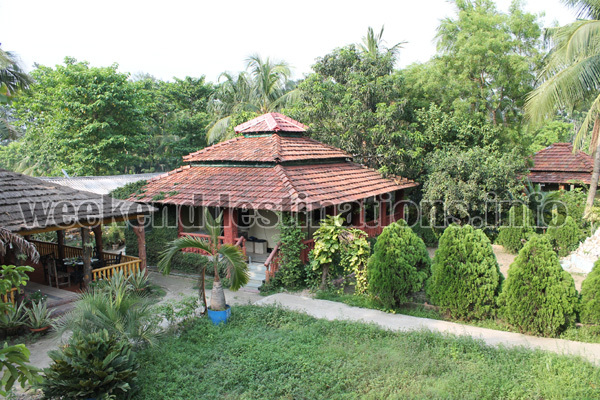 A cruising drive of 35 kms through the villages on the outskirts of Kolkata would take you to this plant nursery, a garden, a modern ethnic guesthouse, a fish farm and a knowledge centre for under-privileged children – all put together. You can spend your weekend angling some great catches, reading some great books, telling stories to the village children and visiting some local attractions like the 300-year old Bawali Rajbari, Ganges riverside and Achipur. Places to see in Bawali: The greatest attraction of Bawali is the 300 -year-old Bawali Raajbari (palace) and its adjacent Navratna Gopinath Temple built during the same time. It is believed that Rani Rashmoni built the famous Dakshineshwar Temple inspired from the architecture of this temple in Bawali. 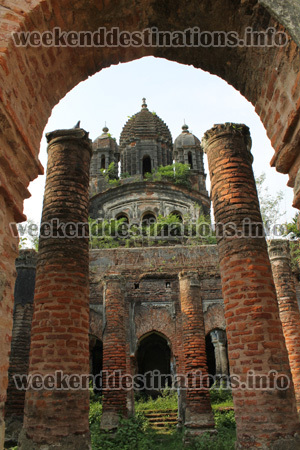 A visit to the temple ruins and the recently renovated Rajbari with its antique furniture, sprawling lawns and verandahs lined with Corinthian pillars would be a nice experience. Nearby Attractions of Bawali: The area around Bawali has witnessed many historical events. The nearby Ferry Ghat of Budge Budge greeted Swami Vivekananda in 1897 when he returned from his Chicago visit. Till date, this event is celebrated by the people of Budge Budge on 19th of February every year. You can also visit the Raypur riverside just 07 kms away and watch the ships passing by. Another significant event, which took place in Budge Budge in 1914, was the Budge Budge Riot, where the Sikh nationalist Gurdit Singh was arrested in his Japanese ship Komagata Maru for protesting against the Exclusion Laws in Canada. Unfortunately, 20 nationalists fell to the British police firing and many were kept under house arrest in the nearby villages. A plaque remembering the 75th anniversary of this incident is now found in the Sikh Gurdwara of Vancouver, Canada. If you are a history addict, then try to make a trip to nearby Achipur on the banks of River Ganges. Interestingly, you would find a Chinese Temple here still holding back its wood carvings and a grand entrance. History says that Achipur was a Chinese settlement founded by the Chinese businessman – Tong Achi who established a sugar mill here during the 1770’s when Warren Hastings was the Governor-General of Bengal. The sugar mill had closed down long back but the temple and Tong Achi’s grave on the banks of River Ganges can still be found. Things to do in Bawali: You can enjoy your weekend, fishing for the greatest catch of your lifetime (maybe a 5 kg Katla or Rohu) or you can simply take your favourite book and read it once more sitting on the balcony overlooking the green paddy fields and ponds. 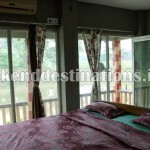 You can also take long village-walks or ask the Nursery Manager to show you all the interesting plants and orchids. If you are thinking of spending some quality time this weekend, then it would be a great opportunity for you to share your knowledge and experience with the less-privileged children of the nearby villages who are taught the regular subjects by a local NGO here. You can tell the children an inspiring story or teach them Geography or anything which you think would help them. In the evenings, you can sit around a campfire and discuss all the ‘necessary nothings’ of human life with your friends and family. The insignificant nice thing of climbing trees and plucking fruits like Mango, Jamrul and Batabi Lebu and eating them without washing can be enjoyed by your children in the lazy afternoons when you are taking a nap. While returning, you can also buy some plants from the nursery and bring it back to your home. How to reach Bawali: You can take trains from Sealdah to Budge Budge Station. From Budge Budge Station (now renamed as Komagata Maru Budge Budge Railway Station) you can take auto rickshaws to reach Bawali. If you are taking the road, then you can take the road connecting Thakurpukur to Bakrahat or Taratola to Bakrahat to reach Bawali. Buses like SD76 would also take you to Bawali from Kolkata. Best time to visit Bawali: You can visit Bawali anytime of the year. 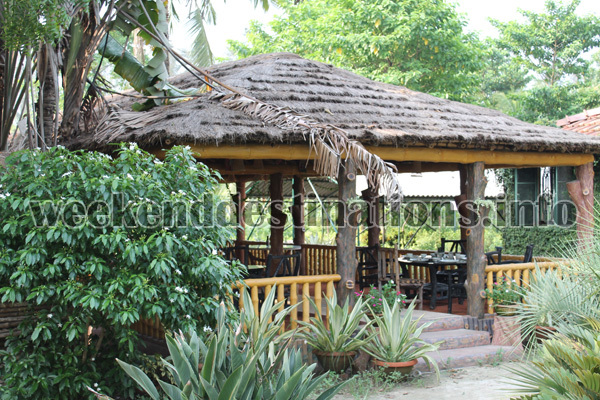 Lodging and dining facilities at Bawali: Presently, there are four cottages for the guests located beside the ponds overlooking the paddy fields and gardens and three gach bari (tree house) rooms. 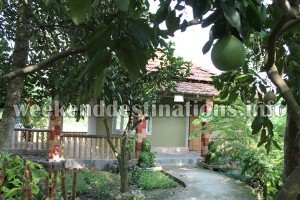 The ethnically designed cottages are equipped with all modern facilities like air-conditioning, attached western bathrooms, nice cushioned double-Beds, televisions and cozy balconies with views of the surrounding greenery. 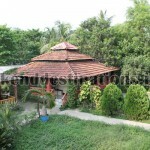 The farmhouse area has an open dining area, a room for arranging small conferences and get-together of 15 to 20 people, two large ponds teeming with fish, a thatched gazebo for your evening gossip and a sprawling garden nursery with thousands of plants. The education centre for less-privileged children operated by a local NGO is also located within the resort area, so be prepared to wake up to the prayer-songs of the children and be spied by some curious cute eyes and occasional giggles. 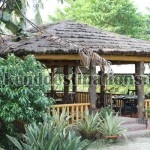 Another great attraction of this resort is its food. Here you can choose from nearly 500 recipes of authentic Bengali food – from the eternal snack of Mochar Chop in the evenings to the rich Dhaka styled Bhapa Ilish in the lunch. If you are a foodie, then there is whole new avenue for you to discover. You can choose to order the favorite dishes of Rabindranath Tagore and Acharya Jagadish Chandra Bose too.